Bioremediation is the process of removing, neutralizing or breaking down pollutants from contaminated sites using organisms. According to the United States EPA bioremediation is a treatment that uses naturally occurring organisms to break down hazardous substances into less toxic or non toxic substances. 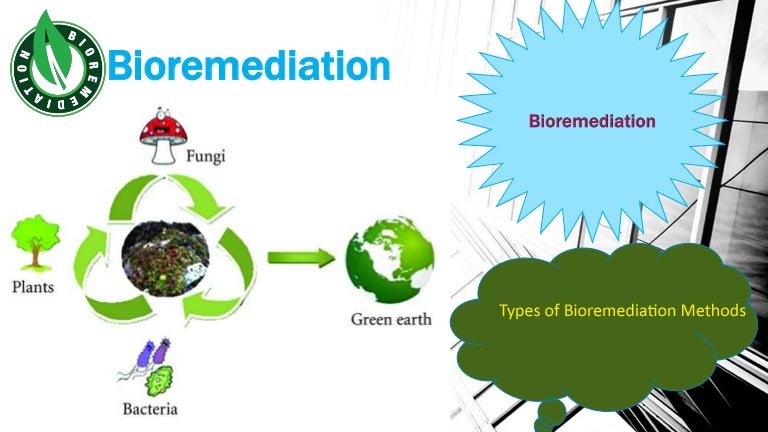 You should know that there's the three types of bioremediation methods. First we have mycoremediation in which fungi-based technology is to decontaminate the environment. Secondly we have phytoremediation which uses plants to bind, extract, and clean up pollutants such as pesticides, petroleum hydrocarbons, metals, and chlorinated solvents. And finally we have microbial bioremediation which as it names explicit details uses bacteria to break down contaminants by using them as a food source. We have two types of treatments in situ and éxito. In situ bioremediation means that we remediate the pollutants on-site. Éxito in other hand means that we extract the contaminated site or pump out that contaminated water location at which was found and take it somewhere else or bioremediation. Some examples of bioremediation related technologies are phytoremediation, bioventing, bioleaching, landfarming, bioreactor, composting, bioaugmentation, rhizofiltration and biostimulation. Hmm you might say wonder how does it work or how bacterias can play the glutens. Let me explain you about the bioremediation process. Let's take in an example of an oil spill from petroleum cargo here. We have ocean petroleum cargo leaks oil or there is an accident as it happened in the Mexican Gulf 2010 bioremediation uses bacteria. In the ocean, Alcanivorax borkumensis is a rod-shaped bacteria that relies on oil to provide it with energy. A good oil eating bacteria living in the ocean and only blooms when oil is present. The bacteria releases enzymes such as starch and sugar which breaks down all particles so that it is easier for bacteria to eat the oil. The bacteria will digest the oil and release water and harmless gases such as carbondioxide the cycle repeats until the food source is run out. There are some specific conditions for microbes to work better. First, we need oxygen in the water. Second, there should be enough nutrients in the ocean and the third the water temperature should be around 15 to 20 degrees Celsius. There are different biological techniques to grow and stimulate bacterias for an effective bioremediation, namely bioaugmentation and biostimulation. Mayaaugmentation is then process to add the pre grow microbial culture to enhance the degradation of the contaminants. And in the biostimulation process we add nutrients to contaminate a site in order to stimulate or help the bacterias already on the site to work faster and efficiently to break down their contaminants. And it doesn't require extensive equipments and labor. Most importantly. it's a nature based process. Recording disadvantages it takes time from months to years to completely treat a contaminated site. Bioremediation can be challenging to measure and see the results over time. Therefore it's less predictable than conventional techniques. And some pollutants such as heavy metals cannot be completely broken down. To conclude bioremediation is an environmentally friendly approach because it allows microbes as a natural organisms to the great toxic compounds. Advanced technology has made bioremediation as one of the most developing methods to restore environment. For more information about pros and cons of bioremediation, click here. 0 Response to "Bioremediation: Definition, Methods, Applications, Advantages and Disadvantages"